I’ve read most of this novel twice. It made two trips to Michigan with me. I abused it. Set it down, picked it up, set it down, picked it up again. Bookmark after bookmark. Repeatedly, before starting over and plowing through it. Different from other Aira novels, seemingly, more complicated, less resolved, confusing. Like being buffeted by the wind on the Patagonian plain. So much going on.A writer (Aira?) sits at a Parisian café and works on a novel he’s considered for some time. He’s wanted to write about a seamstress and the wind. Which he does. And which he includes. There’s a story there. But, once again, I’m not convinced the story is the story. Like my reaction to other Aira novels, the other story is about writing. And for me, that’s enough. Writing. Wonderful writing. With characteristic Aira flair. Pith. Wanderings.Some quotes, because I liked them and in lieu of a real review:Forgetting is simply a sensation***^^^***My parents were realistic people, enemies of fantasy. They judged everything by work, their universal standard for measuring their fellow man. Everything else hung on that criterion, which I inherited wholly and without question; I have always venerated work above all else; work is my god and my universal judge, but I neverworked, because I never need to, and my passion exempted me from working because of a bad conscience or a fear of what others might say. ***^^^***…to see a mad woman going mad. It’s like seeing God. ***^^^***All this may seem very surreal, but that’s not my fault. I realize it seems like an accumulation of absurd elements, in keeping with the surrealist method, a way of attaining a scene of pure invention without the work of inventing it. ***^^^***In a line that sounds like something out of Nicanor Parra:So many years have passed that by now it must be Tuesday! ***^^^***Characterization in a nutshell, the way I like it:He was in boxer shorts and an undershirt, hairy, unkempt, and with the face of a man who had few friends. ***^^^***The only thing that seemed to be in its place was the time, although not even the late dawn in that place had a particular time: one could call it a lapse in eternity. ***^^^***Lastly:It’s not the volume of the voice that matters, but its placement in the story where it’s spoken; a story has corners and folds, proximities and distances…A word in time can do everything…And more than anything else (but it’s all the same) what matters is what’s said, the meaning; in the arrangement of the story there’s a silver bridge, a continuum, from voice to meaning, from the body to the soul, and the story advances by that continuum, by that bridge…Difficult to recommend , except to a few. Something between 4 and 5 stars (for me; you’re under no obligation) rounded up, because I can. Themes of time, memory, loss, family, death, space, and writing—stitched together brilliantly. Always, with Aira, wonderful writing. Real reviews can be found through the following links: the lauditory, the cautionary, and the informative—believe them all. though most of césar aira's books tend to be slim affairs, they make up with inventiveness for whatever they may lack in length. the prolific argentine novelist's works are wildly imaginative, and the depth of his creativity seems matched by the ease with which he is able to blend, cross, and move within different genres. 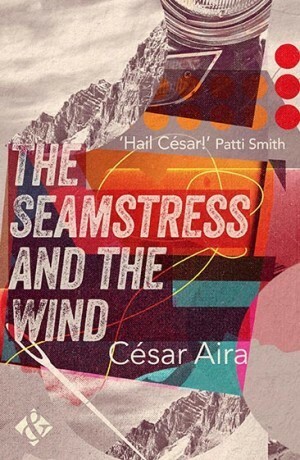 the seamstress and the wind (costurera y el viento), is the sixth of aira's books (of more than eighty) to be translated into english. the seamstress and the wind combines a number of elements that, at first glance, might appear to make for a jumbled, undisciplined, and haphazard work. the brilliance of aira's writing, however, is that he, like a literary alchemist, transmutes disparate components into something fantastical and rewarding. mixing the mundane with the phantasmagorical, aira's novels are richly engaging, for one is never sure upon which point the story is about to veer into the realm of the wholly unforeseen. the word 'predictable' is one that ought never be employed to describe any aspect of aira's fiction. the magnificent range in his work is no mere clever device, but instead reflects an unfettered imagination which allows for a story to freely evolve. the effect is disarming and seems refreshingly natural (perhaps in contrast to the abundance of forced narratives that abound elsewhere in contemporary literature). contributing to the overall affluence of his writing are his reliably intriguing characters, seemingly average yet possessed by a charming singularity. the seamstress and the wind features characters the likes of which will not soon be forgotten (nor their entrances into the story).césar aira is remarkably gifted, and his ability to seamlessly infuse his work with humor, fantasy, poignant observation, unrestrained style, and invigorating prose is truly amazing. although each one of his books is entirely unlike its predecessor, they all seem to complement one another in a way that reinforces the prowess of his creativity. the more aira that i read, the more easily i am convinced that he is one of the most talented, original, and important writers at work today. though few of his books are even as long as one hundred fifty pages, they leave the reader bewitched long after the story has concluded.but i resist giving it up, and in that resistance it occurs to me that there's something else i could rescue from the ruins of forgetting, and that is forgetting itself. taking control of forgetting is little more than a gesture, but it would be a gesture consistent with my theory of literature, at least with my disdain for memory as a writer's instrument. forgetting is richer, freer, more powerful... and at the root of the dream idea there must have been something of that, because those serial prophecies, so suspicious, lacking in content as they are, all seem to come to an end at a vertex of dissolution, of forgetting, of pure reality. a multiple, impersonal forgetting. i should note, in parentheses, that the kind of forgetting that erases dreams is very special, and very fitting for my purposes, because it's based on doubt as to whether the thing we should be remembering actually exists; i suppose that in the majority of cases, if not in all of them, we only believe we've forgotten things when actually they had never happened. we haven't forgotten anything. forgetting is simply a sensation.the seamstress and the wind was rendered from the spanish by rosalie knecht, whom received a fulbright grant to work with aira himself on the translation. ms. knecht is the fourth different translator of aira's works into english. presumably (and deservedly), new directions will continue to publish many of his works in translation for years to come. Other than a touching three-page dialogue between the seamstress and the wind toward the end and someone violating a pregnant woman and then finding upon withdrawal a phosphorescent demon clasped to his member, it reads more or less like a loose and liberal first draft? By far, of the five Aira books available in translation I've now read in about a month, I'd read this one after you read An Episode in the Life of a Landscape Painter, Ghosts, The Literary Conference, and How I Became a Nun. Or if you prefer to read them in ascending order of awesomeness, start with this one? Whimsical to a fault, metafictional in a bad way (is there really a good way? ), doesn't evoke much of a palpable world (not even Patagonia, where some of it's set), very few halting images. Generally, the threads of the story are carried away by the wind of the author's whim. Just really not my bag. At best it's fabulistic. At worst it's very boring. It's true what Bolano said: once I started reading Aira I didn't want to stop. But Roberto also said Aira's mostly boring, and that's true for this one except for a few sparks. I may pick up a few other little Aira books once they're translated (or even try one in Spanish) but not for quite a while. I enjoyed his steadier third-person tone (An Episode in the Life of a Landscape Painter and Ghosts) way more than the lighter metafictional fabulistic first-person all-over-the-freakin'-place tactics. The latter seem to me to lack in heft, but for all their all-over-the-placeness I didn't find them all that funny or enjoyable to follow. "And now it didn't really matter which way she went; if there was any apparition, anywhere, she'd go toward it. What alarmed her was the feeling that she was at the extreme end of caring: when she came out on the other side she would not change direction again. The night could, at a whim, become the kind of uniform desert that would invade her soul, and that possibility filled her with terror. "So here we have from an Argentinian author a comic novel, whimsical and chaotic, bearing with unseemly grace a pair of unwieldy standards: that of the Latin American magical realist novel and the self-referential postmodern one. Even if we readers take the unlikely and fantastical events of the novel's "plot" at face value, it's not as if we're ever allowed to forget César Aira is writing it all down essentially off the top of his head, because he often pops in to remind us of this, and of the circumstances of the cafe in which he is writing.The result it that these characters do not seem to form and take up space on the page as characters normally would, but instead they occupy a hypothetical space in an authorial mind which is laid open to us, albeit a mind in which the young César is also present himself as a child loosely connected with the seamstress we follow into the desert of Patagonia. After all, in this hypothetical space anything is possible, which seems to mean that nothing is, really. Even the missing child that sets the story in motion is a carefully-maintained uncertainty.Somehow, too, this unusual atmosphere lends a note of the horrific to the experiences of these characters, because the settings they inhabit are clearly mental, imagined, and thus mutable and ever-undulating. Their fates cannot be predicted, because the unreality of their being is fully on display, albeit juxtaposed with an ineffable fear that drives them and certifies the emotional truth of what they experience. In Aira's brief moments of absolute clarity, the horrific and the comical stand side by side, shake hands, and perhaps even deign to sit down together for a game of poker. Why do I love reading Aira? Well, his books are incredibly immediate. We get the sense (and we’re right on the money) that Aira is writing these events on the fly, as if he’s watching the events occur as he dramatically narrates them to us. There’s so much energy behind his scenes. It’s worth remembering Aira’s writing process. He sits down in a cafe in the morning and writes whatever comes to mind, even allowing the events in the cafe to invade the story (like a fly, or a drunk man). In this way, his story is not only a story but also a record of its own production. He writes himself into puzzles and then writes himself out of them the next day, refusing to make things easy on himself by allowing extensive revision. Not just anyone can pull this off, by which I mean that few writers following this method could come up with something anyone would want to read, but somehow Aira does it, creating something not simply entertaining and certainly not simply interesting because of the method of its production; besides this, he comes up with something meaningful and thoughtful, often something haunting.On to The Seamstress and the Wind. I just mentioned how Aira writes in a cafe and includes whatever is going on in the writing; well, here we open the book to find Aira in a cafe in Paris, writing about what he’s thinking about as he writes in a cafe in Paris. It’s the new book:"These last weeks, since before coming to Paris, I’ve been looking for a plot for the novel I want to write: a novel of successive adventures, full of anomalies and inventions. Until now nothing occurred to me, except the title, which I’ve had for years and which I cling to with blank obstinacy: “The Seamstress and the Wind.” "It’s a little tricksy, sure, but writing about whatever he’s doing also serves to introduce one the issues he plays with in this book: memory; or, rather, forgetting, losing, maybe never having. We find out that the title he clings to is the result of a dream he had. It was a brilliant dream, a vivid story, a marvel he couldn’t wait to write down, and it had something to do with a seamstress and the wind. "However, when I woke up I had forgotten it. I only remembered that I had had it, and it was good, and now I didn’t have it. In those cases it’s not worth the trouble to wrack your brain, I know from experience, because nothing comes back, maybe because there is nothing, there never was anything, except the perfectly gratuitous sensation that there had been something . . ."So the story itself is gone, if it ever was there. Aira knows it’s pointless to try to remember, but he resists letting it go “and in that resistance it occurs to me that there’s something else I could rescue from the ruins of forgetting, and that is forgetting itself.” Aira goes on to explain how this “taking control of forgetting” is “consistent with my theory of literature.” He expresses a perhaps hypocritical disdain for writers who rely on memory and says, “Forgetting is richer, freer, more powerful.” Which leads Aira to a childhood memory that has its moment of loss and forgetting. He is playing with his friend Omar near a truck’s trailer. Aira is startled to find his friend has disappeared. He’s shocked. Omar was there and now he is not. Aira wanders home and finds out that it is much later than he thinks. Everyone is, in fact, worried about him – he had disappeared, and now he cannot remember the afternoon. He has no idea what happened to that time (even now), but the fact that so much time has passed causes him even more anxiety. After all, he has arrived, and Omar is still missing: “It wasn’t me, they were wrong . . . it was Omar who’d disappeared! It was his mother who had to be told, a search for him that had to be undertaken. And now, I though in a spasm of desperation, it would be much more difficult because night was falling. I felt responsible for the lost time, whose irretrievable quality I understood for the first time.”Omar’s mother is Delia Siffoni, the local seamstress. She’s working on a wedding dress for the pregnant school teacher when she hears Omar is missing. She freaks out, takes her sewing kit and the wedding dress, jumps in a car and tells it to go! She’s certain that her son is in that trailer and on his way to the abyss — Patagonia. “What else could she do?”Now, this is where the story gets whacked, and I mean that as a technical term. Coming home to find his wife missing since she’s fled to find their missing son, Ramón Siffoni takes off too. And then someone else takes off after them, and it’s a mad race to Patagonia. There’s a wreck, flight, a monster child, and the wind eventually falls in love. To be frank, it was a bit magical and, for me, incoherent. That’s not to say it isn’t fun, but I admit that it left me a bit baffled at times, and not in a good way. It’s says a lot for the book, then, that I came away still feeling I’d been through something powerful.There’s a moment with Delia: ”Then this is Patagonia? she said to herself, perplexed. And if this is Patagonia, then what am I?” Indeed. Who is she? What is any of this? I don’t know if there is a symbolic meaning to the monster child or the wind or any other of the strange things we encounter in this book. But there’s the forgetting, the loss, and the chase, and Aira doesn’t leave those alone, and they become a powerful look at his own childhood experiences and, perhaps, into the Argentina of his childhood. What was threatening? What was forgotten? What was lost, that perhaps never was? I will close with a passage I loved from early in the book that I think shows that, despite the whimsy, Aira is talking here about something more serious. The passage shows peace, a near surety of peace, yet a peace threatened by something, perhaps only something imagined but that, imagined, is becoming real:"How could we get lost in a town where everyone knew each other, and almost everyone was more or less related? A child could only be lost in labyrinths and they didn’t exist among us. Even so, it did exist if only as a fear, the accident existed: an invisible force dragged the accident toward reality, and kept dragging at it even there, giving it the most capricious forms, reordering over and over its details and circumstances, creating it, annihilating it, with all the unmatched power of fiction." I am loving this bookReading and rereadingFascinating!Would love to rate it 7 stars :-)WildEvery paragraph an insane novel in its own right! "Forgetting is like a great alchemy free of secrets, limpid, transforming everything to the present. In the end it makes our lives into this visible and tangible thing we hold in our hands, with no folds left hidden in the past. "Cesar Aira. "Si he escrito, ha sido para interponer olvido entre mi vida y yo." C. AiraAira, en este ensayo-novela, híbrido o dos cosas por separado, nos propone la liberación total del escritor alcanzada gracias al olvido. Éste, como el viento, libera al escritor de la pesadez de los recuerdos, el lastre que significa la memoria. Así mismo lo sume en una vorágine de pensamientos que se disipan tan rápido como aparecen.Es entonces trabajo suyo, no el atraparlos para hacer de ellos realidades tangibles y perdurables, sino –en el mejor de los casos- una nebulosa cuyo grado de entropía permita al lector (y a él mismo) vislumbrar una narración liviana y maleable, algo más parecido, quizá, a una ensoñación.Y lo digo de tal manera pues, muy a pesar de las intenciones del autor, la memoria siempre hará mella en el juego narrativo, de alguna u otra manera. El autor mismo recurre a una anécdota de la infancia para configurar la trama de su propia novela: la historia de un chico que al quedar atrapado en la caja de un tráiler que se dirige a la Patagonia, arrastra a su madre costurera y varios personajes más, los cuáles de alguna forma se ven involucrados en el incidente. Pero es en este momento en el cual Aira trata de anteponer la labor del olvido y emprende un proceso casi caótico en el cual la historia pierde de cierta manera la temporalidad y se convierte en un nudo de hechos simultáneos que corren en distintas direcciones. La narración memoriosa se convierte en una suerte de experimento literario de vanguardia; es innegable la influencia surrealista. Es difícil esperar algo de los sucesos, pues, como el mismo Aira dice, en realidad no está contando nada.Ya desde el inicio de la historia, el narrador palpa los hechos desde una ensoñación, apenas distingue impresiones sonoras, visiones nocturnas, recuerdos borrosos. Entre estas vagas remembranzas o mejor dicho, sendas lagunas mentales se va construyendo la narración de una fuga hacia el sur, el fin del mundo en el que sólo habita el viento veloz pero favorable; amigo y enamorado. La historia es en sí un juego de velocidad y hechos increíbles precipitándose hasta los desérticos parajes de la Patagonia. La novela resulta sobre todo interesante en sus intenciones de jugar con los elementos fantásticos. La aparición del viento como ser todo poderoso, de escenas inverosímiles, de niños-perdidos, niños-monstruos, no buscan justificación alguna, pues en realidad no hay una historia que se “esté contando”; sí hay, en cambio, algo que ocurre en el presente y tal vez no entendamos por qué ocurre (a eso obliga el olvido, no vemos el pasado, pues no hay memoria alguna). La obra quizá parezca desordenada, escrita en automatismo que muchos podrían ver como perjudicial para la cohesión de la anécdota, entorpecida aún más por las interrupciones del autor. Posiblemente el mayor defecto de este ensayo-novela es, precisamente, lo ensayístico del texto. Aira es en todo momento argumentativo, analítico, reflexivo. Su narración no es tan veloz como el viento que sacude a los personajes, pues él mismo frena en momentos las acciones para meter su cuchara racional. No es del todo grave si se mira como una forma de invitar al pensamiento y a la profundización de temas de índole estético o filosófico. Sin embargo, en mi muy personal punto de vista, creo que en verdad este asunto hace de la novela un tanto aburrida en ciertos momentos. Y a pesar de eso, resulta en su globalidad un texto agradable y rico en reflexiones que retan al lector. Es, ante todo, una invitación a lo inesperado y una puerta hacia el universo íntimo del autor como ser humano y como creador. I am so completely bemused by this book that I don't know whether to continue writing or just shrug my shoulders and go get some ice cream. What can do about an author who never edits, never revises, but who keeps pressing on regardless where it takes him. And it takes him to some really weird places, like the strange wastes of Patagonia where Aira severally dumps his characters and lets them carom off one another.Let's see what we have here: We have a young wife named Delia Siffoni, who is searching for her son Omar (who, apparently isn't lost); her husband Ramon, who's searching for her; the truck driver Chiquito in whose truck Delia thinks Omar is; Silvia Balero, who is to get married in a day or so; Silvia's wedding dress, a character in its own right; the Monster, who was brought into existence from Silvia; and Sir Ventarrón, one of the winds of Patagonia (yes, as I said). Who would have thought that this short novel by César Aira, who hails from Coronel Pringles in the southern part of the State of Buenos Aires (near Bahia Blanca), could hold one's attention and bemuse the reader so? Well, he does. Reading The Seamstress and the Wind is like viewing a Dali painting in motion. There is one odd little paragraph near the end that puts it all in a nutshell:Now I remember a type of candy that the children of Pringles adored in those days, a kind of ancestor of what afterwards became gum. It was very local, I don't know who invented it nor when it disappeared, I only know that today it does not exist. It was a little ball wrapped in parchment paper, accompanied by a little loose stick, all very homemade. One had to chew it until it got spongy and grew enormously in volume; we knew it was ready when it no longer fit in our mouths. We'd take it out, and it would have transformed into an extremely light mass that had the property of changing shape when blown by the wind, to which we exposed it by putting it on the end of the little stick. That must be why it was only a local candy: the winds of Pringles are like knives. It was like having a portable cloud, and seeing it change and suggest all kinds of things.... It was healthy and entertaining.... The wind, which left us as we were (it limited itself to mussing our hair) ceaselessly transfigured the mass ... and there was no point falling in love with a particular shape because it would already be another, then another ... until suddenly it would solidify, or crystallize, into any one of the shapes that had been delighting us for so many minutes, and then we would eat it like a lollipop.This paragraph is a microcosm of the novel and a delightful statement of Aira's authorial philosophy. Now I'm going to have to buy some more of Aira's books because the form of candy he provides is highly addictive. This was my fourth César Aira. I've read How I Became a Nun, Ghosts, and Varamo, and this was my least favorite. I'm not saying it's not worth reading, but if this had been the first I had encountered, I would have been much less receptive to Aira's "fuga hacia adelante" approach, which sounds messy when you try to describe it. Basically it seems as though Aira throws a few disparate elements bouncing around his head into the air, mixing high and low, theoretical and material, and from the way they fall, he creates a plot around them. Or vice versa. And via his skill, imagination, intelligence, and that x-factor, a coherent text emerges. It's a surreal coherence, but a coherence nonetheless. And this one just didn't click! But when you write that many books, you're sure to have a few misfires. I'm just curious about how this one in particular made it over into English, and into publication at New Directions before some of his other titles. "Life carries people to all kinds of distant places, and generally takes them to the most far flung, to the extremes, since there's no reason to slow its momentum before it's done. Further, always further... until there is no further anymore, and men rebound, and lie exposed to a climate, to a light... A memory is a luminous miniature, like the hologram of the princess, in that movie, that the faithful robot carried in his circuits from galaxy to galaxy. The sadness inherent in any memory comes from the fact that its object is forgetting. All movement, the great horizon, the journey, is a spasm of forgetting, which bends in the bubble of memory. Memory is always portable, it is always in the hands of a wandering automaton. "Funny, nonsensical, but beautifully written. The story takes a shocking but magical turn three-quarters into the book, and leaves you breathless with its conclusion. When you pick it up, just know that some weird sh*t's gonna go down. Aira is one of the most consistently beguiling, delightful writers I've come across, and while maybe this isn't quite as completely brilliant as 'Scenes from the life of a landscape painter' it's still an utterly wonderful book. It feels more strictly surreal than his other work I've read (in so far as anything that is surreal is strictly so), the weird little narrative is beautifully grounded by his own faux childhood reminiscences and his incredible, world-warping musings about travel, adventure, meteorology, simultaneity and, of course, Patagonia. He blends rituals and humor together into something totally his own. The more I read of César Aira, the less I feel I understand him. Ghosts was kind of surreal and creepy, and had some of the best scenes set in a supermarket that I have ever read (this is meant to be more of a compliment than it sounds). I liked The Literary Conference less, but it still had some audacious meta bits. This...I have no idea, man. But I think I'd rather be reading Javier Marias. My second Aira novel, read on a long day of plane trips. This has a wild set of conceits that fit into what we know of south american surrealism and absurdism, only without the long-windedness so common to Marquez, especially in his later books, and without much attempt at characterization. One of the features of the novel is the difficulty the narrator has in coming up with the novel's plot, and his attempts at getting the attention of a parisian waiter. You can see and feel the fun Aira had as he imagined and invented things that are best encountered as a surprise. Very, very enjoyable. This was a trippy little book. I could see how the magic realism could of been perceived as over the top by some. Although the story was a little hard to follow(fault the reader) at times but in the end the theme and plot jelled well and was quite brilliant overall. I remain in awe of how many of these books Aira pumps out and wish I read Spanish. I remain envious that the Spanish reader gets to look forward to the constant release of these novels. wildly inventive and madly endearing, the handful of characters who get caught up in this strange vortex of a fictional downpour each have their own unexpected fate and unpredictable tale to tell. as usual Aira lets his story develop and unfold in its own way and in its own time. You had better check your standards and preconceptions at the door and enter his world on his terms. if you want to compare this to anything else you are missing the point. I love this writer and this, of the five books that have been translated into English, I think is the best. A little hard to get into, a bit like a rambling Uncle, but the last twenty pages more than makes up for the first twenty! A perfect book! A strange and fantastic book! 3.5 Good, but probably my least favorite of his so far. Everytime the story seemed to be going somewhere, it would drift off. Un escritor nos cuenta su proceso de escritura. Mientras tanto el viento se enamora de una costurera, el marido de ella juega todas sus posiciones a las cartas. Un loco viola a una mujer embarazada y nace un niño monstruo. y Cesar aparece como personaje secundario. Empecé a leer a Cesar y ahora simplemente no puedo parar, no es de lo que más me ha gustado hasta ahora. Pero sin dudas lo seguiré leyendo. Magical realism from S America. Just go with the flow and re-read if necessary. Lovely, as disturbing as it was delightful. Aira's voice is wholly his own, and so refreshing to come across. César Aira is a compact, comprehensible Roberto Bolano. This terrifies academic readers, because if Bolano is made compact and comprehensible, how can they pretend to be the only ones who understand him? To add to the nightmare, Bolano himself loved Aira, making it an active duty for most of the literati to ignore his prolific enchantments. Thus, Aira went largely unnoticed in the English language until New Directions started selecting a fantastic sample of his 80+ novels to translate and publish in paperback. The results have been nothing short of astounding, revealing a deconstructed Kafka obsessed with the frightening nonsense of civilization. The Seamstress and the Wind, the latest selection in the series, is sharply translated by Rosalie Knecht, who never compromises Aira's wit while replicating his brevity. The novel's genius lies in its narrative structure. We start with a novelist sitting in a cafe in Paris, alone. He is struggling to begin a book, for which he has only a title, the Seamstress and the Wind. He recalls a scenario from his youth in Argentina, when his parents thought he was lost. Then, it's revealed that the novelist's friend, the son of a seamstress, is the one who is truly lost.. The novel's action has begun without beginning. And only 3/4ths of the way into the action do we find out the novelist's name is César Aira, who has, by this point, lowered us expertly through several layers of reality into a magical mode. There are few writers so skillful who show the restraint necessary to execute such a fantastic action without ever losing a foothold in the required realism. Aira's Saramagoan narrator, agnostic by nature, is skeptical of good yet remains devoted to it. But unlike Saramago, whose omniscient prose can put a whole history in a page, Aira does not write as much as he details, ignoring set-up and describing scenes only when absolutely necessary. In The Seamstress and the Wind, Aira shows us random scenes from a race across the desert. The competitors are: the seamstress, who thinks her young son has been kidnapped and hires a beaten down taxi to find him; a Bunyanesque truck driver and his magically large rig; the seamstress's husband, a degenerate gambler; the wind, personified as a gallant if kooky knight in love with the seamstress; a pregnant bride whose dress the seamstress was sewing, and the pregnant bride's unborn fetus, who is some kind of glowing wind monster. The ending of the novel is unsatisfactory, by most measures. Aira puts us through a great deal of imaginative work to build one final absurd scenario ¬– that he discards completely a few sentences before its climax. Imagine Hamlet ending just before Laertes and Hamlet are to duel. Aira loves that tension and makes it the center of his story, and of the lives of the characters within it. As Aira's narrator and namesake states, "It's curious, but everyone has a life, even the tourists, who by my reasoning shouldn't. No one leaves life anywhere, all lives seem to be portable. To be practical about it and drop the metaphysics, having a life is equivalent to having business, affairs, interests. And how can anyone strip himself of all that? … I've stood on the threshold of all the beauties, all the dangers. And the sums did not add up." Most of life's scenarios are unresolved, and it's up to us to carry on before they drive us mad. "Taking control of forgetting is little more than a gesture, but it would be a gesture consistent with my theory of literature, at least with my disdain for memory as a writer's instrument. Forgetting is richer, freer, more powerful…. I suppose that in the majority of cases, if not in all of them, we only believe we've forgotten things when actually they never happened. We haven't forgotten anything. Forgetting is simply a sensation." "Pretty soon he sees opening in front of him, like a marvelous flower, the world of vices that he could, that he can, practice with impunity thanks to his position as a good husband, a good family man. ""To think I had to eat what a thieving wind brought me!" Mijn vijfde Airaatje in korte tijd, en dit was het allervreemdste van allemaal. Kan je nagaan, want Aira is altijd al te maf om na te vertellen door zijn maffe plotwendingen, maar de mafheid is nu zelfs zo groot dat je niet eens meer van 'plot'(en dus ook niet van 'plotwendingen') kan spreken. Het gaat eerder om een uitbarsting van inventieve energie, van voortdurende creatieve improvisatie, van bizarre associatieve verbeelding die van de ene surrealistische inval naar de andere duikelt. Een beetje als Alice in Wonderland, maar dan grilliger. Een soort tomobola van fragmenten uit sprookjes, die geen samenhangend verhaal vormen maar de lezer van de ene naar de andere verbazing leiden. Een soort verbrokkelde caleidoscoop van droombeelden die geen duidelijke figuur vormen, maar de lezer verbazen door hun gefragmenteerde kleurenpracht. Zoiets. Het begint allemaal vreemd maar overzichtelijk: een schrijver, Cesar Aira (ja, dezelfde), deelt ons mede al een tijdlang een roman te willen schrijven over een naaister en de wind, maar hij is de plot vergeten. Hij filosofeert wat over de aard van het schrijven, en oppert dat niet logica en het geheugen het schrijverschap kenmerken maar dat de kern van literatuur juist bestaat uit vergetelheid en lacunes in logica en geheugen. Meteen nadat hij dat gezegd heeft vliegen de lacunes de lezer om de oren, en gaat alle logica overboord. Ergens zegt hij 'I submit myself to the words before they make sentences, when they still are purely present' De kracht en potentie van het woord, nog voordat het deel uitmaakt van een logische zin, DAAR gaat het hem dus om. In een normaal verhaal volgen metaforen en literaire beelden elkaar op en hangen ze binnen een groter geheel samen, maar bij Aira staan die beelden los van elk logisch verband en glanzen ze ons in hun volle raadselachtige rijkdom tegemoet. En wat een beelden inderdaad. Een moeder zoekt haar kind in de eindeloze leegte van de Patagonische woestenij. Een bruidsjurk wordt meegenomen door de wind en wordt, al wapperend en zwevend, een onbegrijpelijk beeld van pure schoonheid. Windvlagen en maangetijden doen alles van vorm veranderen, zodat een trucker zijn auto eerst van kleur ziet veranderen en vervolgens hem ziet oplossen in de leegte. Een windvlaag die alle Patagonische winden verenigd fluistert liefdevol naar een naaister. Twee kaartspelers spreken een geheim woord uit, beseffen dat het beslissende spel nu gaat beginnen, en laten de wind de kaarten delen. Een vader en een moeder verdwalen in een landschap dat voortdurend van vorm verandert, zoals eerder een kind verdwaalt in een labyrint dat misschien alleen in zijn verbeelding bestaat. Dat soort raadselachtige flarden schotelt Aira ons voor, 132 bladzijden lang. Elke flard is nog weer raadselachtiger dan de flard ervoor, en aan het eind van het boekje is geen enkel raadsel opgelost. Gelukkig niet. Je kunt dit zonder meer lezen als een soort postmoderne stijloefening: als een demonstratie dat alle orde fictief is en het leven niets meer dan een grillige droom. Maar het is volgens mij vooral een demonstratie van vertelplezier, waarin Aira alle logica opgeeft om zo alle ruimte te geven aan zijn bizarre fantasie. Verhalen dienen bij Aira niet om de wereld te 'beschrijven', maar oms ons te verbazen en te verrukken. Of om ons voor even mee te voeren in de vloeiende en veranderlijke wereld van fantasie en droom. In dit boekje doet hij dat echt prachtig. Op naar mijn zesde en voorlopig laatste Airaatje! Penulis yg ga bisa dipercaya. Ngelantur kemana-mana, seperti diketik pas lagi mabok. Diawali tentang si narator, Cesar Aira sendiri, yg sedang kebingungan mencari plot untuk novelnya. Lewat mimpi dia dapat plotnya, tapi malah lupa apaan. Aira di sini rasanya sedang bikin lelucon soal para penulis fiksi yg memakai autobiografi dirinya buat dijadiin cerita. Kisah utamanya lainnya adalah soal teman masa kecilnya yg hilang misterius. Dan seperti judulnya, ada soal tentang penjahit dan angin, tapi saya ga ngerti. Beruntung ada review di Electric Literature, dan ada nasihat untuk yg mau baca novel apaan ini: Don’t try to understand; to not understand is to be in on the joke. César Aira Rosalie Knecht - César Aira (born on February 23, 1949 in Coronel Pringles, Buenos Aires Province) is an Argentine writer and translator, considered by many as one of the leading exponents of Argentine contemporary literature, in spite of his limited public recognition.He has published over fifty books of stories, novels and essays. Indeed, at least since 1993 a hallmark of his work is an almost frenetic level of writing and publication –two to four novella-length books each year.Aira has often spoken in interviews of elaborating an avant-garde aesthetic in which, rather than editing what he has written, he engages in a “flight forward” (fuga hacia adelante) to improvise a way out of the corners he writes himself into. Aira also seeks in his own work, and praises in the work of others (such as the Argentine-Parisian cartoonist and comic novelist Copi), the “continuum” (el continuo) of a constant movement forward in the fictional narrative. As a result his fictions can jump radically from one genre to another, and often deploy narrative strategies from popular culture and “subliterary” genres like pulp science fiction and television soap operas; on the other hand, he frequently deliberately refuses to conform to generic expectations for how a novel ought to end, leaving many of his fictions quite open-ended.While his subject matter ranges from Surrealist or Dadaist quasi-nonsense to fantastic tales set in his Buenos Aires neighborhood in Flores, Aira also returns frequently to Argentina’s nineteenth century (the two books translated into English, The Hare and An Episode in the Life of a Landscape Painter, are examples of this; so is the best-known novel of his early years, "Ema la cautiva" (Emma, the Captive)). He also returns regularly to play with stereotypes of an exotic East ("Una novela china", A Chinese Novel); "El volante" (The Flyer), and "El pequeño monje budista" (The Little Buddhist Monk)). Aira also enjoys mocking himself and his childhood home town Coronel Pringles in fictions such as "Cómo me hice monja" (How I Became a Nun), "Cómo me reí" (How I Laughed), “El cerebro musical” (The Musical Brain) and "Las curas milagrosas del doctor Aira" (The Miraculous Cures of Dr. Aira). His novella La prueba (1992) served as the basis --or point of departure; only the first half-hour follows the novella-- of Diego Lerman's film Tan de repente (Suddenly) (2002). His novel "Cómo me hice monja" (How I Became a Nun) was selected as one of the best 10 publications in Spain in the year 1998.Besides his fiction, and the translation work he does for a living, Aira also writes literary criticism, including monographic studies of Copi, the poet Alejandra Pizarnik, and the nineteenth-century British limerick and nonsense writer Edward Lear. He wrote a short book, Las tres fechas [The Three Dates], arguing for the central importance, when approaching some minor eccentric writers, of examining the moment of their lives about which they are writing , the date of completion of the work, and the date of publication of the work. Aira also was the literary executor of the complete works of his friend the scabrous poet-novelist Osvaldo Lamborghini (1940–1985).The American publisher, New Directions, has put out four of his works in English translation (An Episode in the Life of a Landscape Painter, How I Became A Nun, Ghosts, The Literary Conference). New Directions plans to publish more works of Aira's in the near future.